The Dean Dollar Band has risen to prominence as a premier headliner of Southern Music. Dean’s innovative-explosive guitar playing and powerhouse band continually rock concert venues, fraternities and corporate events across the country. 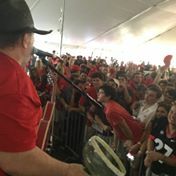 High energy, in your face, hard-hitting music combined with Dean’s personable rapport and entertainment, that is what sets the Dean Dollar Band apart from the pack. Experience the heart and guitar playing of this master of his instrument and his talented band as they traverse the sound-scapes of the South and beyond. From tight arrangements to spontaneous limb-dancing jams, the the Dean Dollar Band will rock you, move you and captivate you. Timeless music from a timeless band.